When we started thinking about opening a studio, we kept coming back to three things - strengthen, connect, engage - that we were looking for in the larger yoga community. There are so many great spaces and teachers in Denver (and around the country) and yet we found ourselves traveling far and wide to tap into those teachers and spaces that we felt truly elevated the practice and challenged us to be better people and global citizens - in each and every class. It occurred to us that if we could create a space that brought those components into one place, and could also deliver a high quality, thoughtful, intentional and challenging class Every. Single. Time. We might just be on to something special. BBY’s teachers, students, and the neighborhood we live in are all integral to who we are and how we exist within the larger yoga community. Walking in to a class at BBY, whether it is your first time or your 500th, should be a special, welcoming, challenging and completely unpretentious experience. Our goal is to help you connect to the grit you already have inside of you and the grace that we believe we could all benefit from extending to ourselves and each other. Our core values are something we come back to time and time again. 1) Strengthen: You will find your power in our space. You will grow stronger in physical body, mental focus, and connection to your breath. You will develop deep and meaningful relationships with your fellow yogis, teachers and your practice. We are also committed to strengthening this community by actively working to make our space and yoga available to every. single. body. 2) Connection: BBY provides a place to connect to yourself. We will encourage you to connect to your breath, your body, mind, spirit and the world around you. BBY will also ask that challenge you to ask yourself how you think about the world and we hope to encourage you to step outside of your current belief systems and be willing to address your internal and implicit biases - about your own body, your own limitations, and your role and responsibility in the world. 3) Engagement: You will be challenged to engage physically, mentally and spiritually in every single class in some way. We will also encourage you to engage with your neighbors and the community around you. Every class and each teacher at BBY not only embody these ideals but also, we each strive to show up with our truest selves every single time. It is this commitment to authenticity that allows us to be connected and engaged to our truest selves which, in turn, helps us support our students as they find their truest selves. As a team of teachers, we are a tight knit group, committed to growing our practice and our studio community. Just like our yoga, we are a work in progress, a journey. Our experience as teachers, facilitators, guides, and as a studio is evolving. We believe in always learning, always growing and always challenging ourselves. This means embracing the valleys and the peaks, it means we explore our biases, question the way things have always been done, examine our habits and struggles and that we are committed to becoming familiar with that space outside of our own comfort zone. We value feedback, constructive and complementary and we honor each other’s differences, style and experiences because after all, isn’t that what makes life so special? In some ways, it becomes clear that our differences are truly the only thing that unite us. Our life experiences, beliefs and values shape who we are and how we interact in the world. For example, my life lens is from the point of view of a white woman of privilege born and raised in Colorado and as the studio owner, means that I regularly question my responsibility to and for issues like gentrification, racism, advocacy and activism. As a yogi, it means I strive to be aware of how my actions affect other people and what it means to truly embrace and work toward inclusivity. As a mother, it means I feel a responsibility to raise a kind, brave, and mindful child. We all have bias - both implicit and explicit. As a studio and teachers, we do our best to be aware of the bias we bring to our interactions and experiences. This - just like our yoga journey - is evolving. It takes practice, a willingness and commitment to try and view things from a different lens than our own. We respect and value the experiences that make each of us who we are, honoring that we likely haven’t lived that experience and so are committed to finding ways to discuss, embrace and possibly even grow through those ideas that may challenge us. If you would like to learn more about appropriation of indigenous cultures in the wellness industry, we invite you to check out some of these articles. And, we would love to start a conversation with you should you have any questions or comments you’d like to share. It’s Time to Stop Exploiting Native Cultures in Wellness. Here’s How. If this sounds like something you want to be part of - we can't wait for you to join us at Better Buzz. Space is limited, and our classes do fill. Please be sure to register in advance. Payments will be automatically charged to your credit or debit card each month. Auto-pay contracts require 7-days notice to effectively stop your payment. 30 days of unlimited yoga with no strings! *Available to new students only, non-refundable and may only be used once. *Expires 3 months from date of purchase and are available only for use by the purchaser. Get my 10-class pass now! Drop-in pricing is only $15 for a class! Want to give someone the gift of yoga? We've got you covered! *Promotions on gift cards may not be applied to membership dues. Please note - our schedule is powered by MindBody which is experiencing slow loading times. We apologize, but please give it a second and it should appear soon. To download a copy of our current class schedule, click here. Devyn’s mission is to inspire others to self-love and to know that each person possesses greatness in their own skin, soul, and mind. Her attitude within her teaching is to serve the students and allow them to find creativity through movement and making new shapes with their bodies. She desires to create uniqueness in her flows and to get her students to try things they didn’t know they could do. Devyn is an E-YRT 200, CPT, and enjoys the edge of yoga meeting plyometric power movements. She has specialized in yin and restorative yoga as well, completing a balanced approach to grounding and intensity. When Devyn is not at the studio, or the gym, she enjoys photography, cooking, and reading. Melanie’s classes are filled with breath, heart, warmth and great music. She believes in slowing down and savoring each breath and fully feeling into each movement, both in her own practice, and when leading. Melanie views teaching as an offering, as her opportunity to share what she loves and cherishes about yoga, which is time for breath and time for feeling alive, empowered and strong. Mel typically gets on her mat before each class and feel what is needed in her body, believing in the wisdom of our own bodies to guide our practice and dictate what we need. When she is not teaching, Melanie enjoys spending time with her husband and 2 sons, friends, family and 2 dobermans. Melanie completed her 200 hour YTT in 2014, under a Baptiste and a Bhakti trainer. After more than a decade of consistent yoga practice, Sara decided she wanted to share her knowledge and passion for this practice with others. Yoga has provided an outlet that allows Sara to shed what she no longer needs and make space for what it is that she does need. Her intention for classes is to guide students to this sense of balance so they can bring it into their everyday lives. Sara became certified in December 2016 with CorePower Yoga’s 200 hour training program. She hopes to bring a lightness and playfulness to her classes so that her students walk away feeling they have more of what they need and less of what they don’t. Susan quickly fell in love with the practice as a way to get fit and healthier and discovered how important yoga was for her physical, emotional, and mental health. As an avid runner, Susan has found yoga an incredible compliment be able to perform at her best. Through yoga, she has reinvented herself, and has a new life mission supporting others through all of life’s joys, difficulties, and inevitable struggles. Recently, Susan began the transition to a plant-based lifestyle. She is fascinated with nutrition and its relationship with mental as well as physical health. Running began her journey toward a healthier lifestyle, but yoga and nutrition has allowed Susan to dig deeper in finding her healthiest and happiest self. Susan completed her RYT200 training at Asana Studio in Arvada, Colorado. Christine, a native of Colorado is a classically trainer dancer who says yoga found her at precisely the right moment. In hopes of reducing stress, Christine wondered into a yin yoga class and was immediately hooked. In 2018 Christine took her passion for yoga to the next level and completed her 200 hour TT at Better Buzz Yoga. She is gratified and humbled to be one of the first graduates of the Better Buzz Teacher Training program. She went on to receive her yin yoga teaching certification from the Freyja Project in 2019. Known for her calm, caring and kind demeanor, Christine is excited to share yoga with her students to help them gracefully discover how to live each moment more mindfully and how to cultivate more self-love, gratitude and resiliency. Elyse's journey of love really blossomed the day she stepped on her mat 6 years ago. Feeling lost, as most early twenty-somethings do, yoga was the one thing that brought intention to her life. A weekly class changed her direction so drastically, she needed to further her yogic growth so after moving to Boulder, she studied under Shannon Paige and graduated with 200 RYT and Anjali Restorative certifications. Always looking for more knowledge, she started her 300hr training with Amy Ipolitti in 2018. Inspired by the world around her, she brings a sense of empowerment and love to each class. By using breath, meditation and music, she hopes to keep each class light with a taste of power. Her goal is to learn, along with her students, how to greet life with open arms and find love and light in everything. She hopes each yogi leaves class refreshed and ready to take on the world! Self-discovery is a beautiful thing, and just one of many facets of yoga that keeps Jamie coming back. She first came to yoga simply as a means to help ease some of the strain she was experiencing in her knees, but found the practice has shaped and changed her life in ways innumerable. It has given her body more strength and endurance, it has challenged Jamie to deeply explore her mental landscape. Jamie believes yoga presents infinite potential for physical, mental, and spiritual growth, and she is grateful to be part of this community. 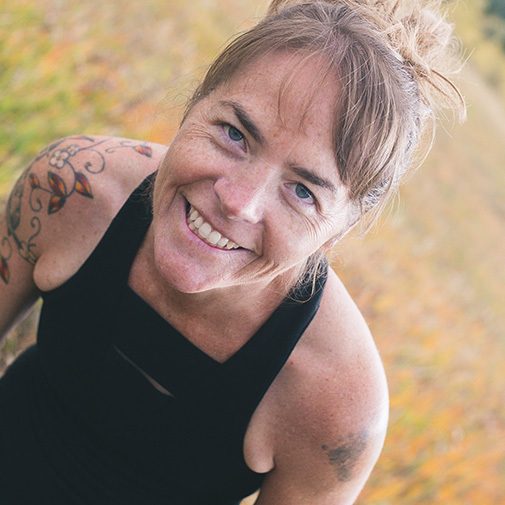 Jamie loves guiding students through a physically challenging and mentally engaging practice and loves all that she learns from and with everyone in the local yoga tribe. Jamie’s motto is “Let’s root for each other, and watch each other grow.” Jamie completed her RYT200 at LifeTime Fitness in Centennial, Colorado. Yoga came into Narie’s life when years of running and high-intensity no-pain, no-gain workouts started to take their toll. Narie wanted to find something that would still push her physically but also bring her a sense of peace and clarity. Narie teaches empowering classes that emphasize strength training and a fusion of the HIIT exercises she loves along with the flow of Power Vinyasa. When she is not getting her Namaste on, Narie enjoys spending time with her family and fur children, hiking and getting out in the mountains, reading, and eating anything she can get her hands on. Narie feels so blessed and excited to be a part of the dynamic team at Better Buzz and she can't wait to slay with you on and off the mat! Narie completed her RYT200 training at the River in Denver, Colorado. Yoga has both lifted Katie up in love and joy and it has taken her to her knees in humility and self reflection. Katie began practicing and studying Hatha yoga and meditation in 1992 and gained her first yoga certification in 1997 from Ananda Mandir in Nevada City, CA. Life has taken her through some major changes in the past 3+ years which, sent her around the world and through 4 significant moves and has landed her here in beautiful Denver. All along, Katie’s yoga practice remained her faithful companion, connecting her to her breath and the present moment throughout life’s challenges. In teaching yoga classes and many teacher training programs over nearly 20 years, Katie has witnessed what a personal journey yoga is for each individual. As a Doctor of Physical Therapy since 2001, Katie is a bit of an anatomy and alignment geek in my classes. Prior to teaching yoga, she taught gymnastics to elite, collage and recreational gymnasts for 9 years and was a high level competitive gymnast for eight years. Overall, she brings many layers and years of experience to her yoga classes, moving fluidly from one asana to another, Katie strives to set up an open, safe and fun environment in which students can challenge themselves, nurture themselves and learn to have a deeper compassion for others. Katie has been told that she has a creative and compassionate yet challenging style. Her goal always is to draw each individual into the wisdom of their own body and the experience of yoga on and off the mat! Kelly has been practicing yoga for almost 15 years. It is woven into the fabric of her being and her passion is bringing the peace, joy, and strength of yoga into her community. Kelly enjoys teaching challenging classes, encouraging students to explore their physical and spiritual edge. Her classes offer students the opportunity to take risks and work hard to grow in their practice. She also enjoys having fun and designing soulful classes to some of her favorite artists. It is Kelly’s sincere hope that taking risks and having fun on the mat translates into students finding their purpose and the strength to follow it off the mat. Kelly is excited to be part of the BetterBuzz and Sunnyside community. Yoga is a journey. It breaks society’s conditioned norms of checking things off a list, of striving for perfection, of always thinking what’s next. Yoga is presence within the moment and excitement for personal growth. Meg first discovered yoga as a form of fitness in 2012, but quickly realized it wasn’t just her biceps that were growing - it was her soul. Meg became addicted to the practice, craving space within her own authentic self for the first time. When she’s on her mat, she gets lost in the moment and in growing her light. Meg hopes to provide her students with a space where they can be vulnerable, leave the outside world behind, and look within themselves to find the power of their own inner light. When we all shine we make the world a brighter place. Meg completed her RYT200 at CorePower Yoga in 2015. I am a brand new yoga teacher, recently graduated from Better Buzz’s first ever teacher training this past fall. Better Buzz captured my heart and offered me community here in Denver, and I am beyond thrilled to find my voice as a teacher! Labor and Delivery RN by day and novice meditator by night, yoga greets me with gratitude on and off my mat--with legs up the wall to calm my brain before sleep, an impromptu Malasana squat in the nurses station at work, or sinking my breath with my neighbors, mid-flow. I am grateful for what yoga has brought to my life, and I am eager to share it in a new way. I am an avid backyard gardener, a seeker of mountain air, and a lover of good food and laughter. I hope to bring optimism, creativity, and community to my yoga class. Thanks for being a part! Morgan is a creative. Raised in a family where the hand was an essential tool, her earliest expressions came in the form of musicianship, tactile arts, and visual storytelling. Drawing from her ancestry, Morgan weaves her sequences from the wisdom of the Aztecas, and the Cherokee; she routinely uses her instincts to support the needs of her students, rarely repeating the same class twice. A born traveler and linguist, Morgan supplements the flavor of her teachings with experiences gathered from far corners of the earth. With hundreds of hours of teaching experience in Vinyasa, Yin, Prenatal, and Bilingual yoga, her empowering sequences will deliver you to numerous energetic peaks. Whether in a public class or private instruction, Morgan offers supportive assists and her fondness of storytelling will leave you feeling fresh, light, and connected. Morgan is an E-RYT instructor with a 500 RYT certification through Kindness Yoga. My love of yoga started back in 2008 in Gainesville, Florida when a friend dragged me to a 100 degree/100 minute practice. I was hooked immediately! My practice has taken me up an down the East coast, all the way out to Korea and now to the great state of Colorado. I found my yoga home here in Denver at Better Buzz and just completed my 200RYT training with the very first class of Better Buzz Teacher Training. As a teacher I seek to lead classes that are both accessible to everybody and help promote the understanding that yoga isn't just for flexible people -- it's for everyone and every body type. Expect classes full of community breath, great music and positive energy. Life has a beautiful yet unpredictable cadence. In the past few years, Jaime has lived in different countries, moved multiple times, married her best friend, lost and found important people, started a business (Better Buzz Yoga!) and recently gave birth to the most incredible, brave and kind baby boy, Colden Briggs. Yoga reminds her that no matter what is going on in her world, she knows if she can make it to her mat, she has the opportunity to reconnect, reset and find her center at any time. This practice is about connection for Jaime and she is grateful for the daily reminder of the journey we are all on. Jaime loves hearing the collective sigh of letting go, creating union with breath and the simple act of being in a space with others, wherever we are on our path. She finds it to be a lovely metaphor for life and is honored to have the opportunity to practice with you whenever you may meet! Jaime completed her RYT200 training at Spirit Yoga Studios in San Diego. Joy’s teaching style is light, bright, challenging, playful, inspiring and sometimes upside down. She first discovered Yoga in college where she happily practiced and studied Iyengar. After a long chunk of time her yoga practiced was wakened out of its hibernation when she took her first heated vinyasa class in 2008. The rest is history, one may say. Joy has a playful way of bringing you back to your childhood and back to your own personal freedom by gently challenging you to declare freedom from all self-made limitations. She will work to always remind you that the world is filled with more beauty and goodness than not and that YOU are perfect!